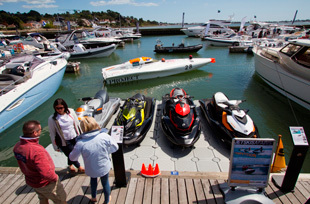 The Sandbanks Boat Show 2013 is going to run at Salterns Marina in Poole from 11-12 May. The popular show, which is in its third year, is free to enter and will have over 80 new boats for the crowds to enjoy. Ideally timed with the start of the season, organisers say it’s a great opportunity to look at everything from dinghies and jet-skis to large motorboats plus a wide range of other kit. Confirmed exhibtiors include: Salterns Brokerage – distributors for Greenline, Cranchi, Sealegs and Goldfish – and Wessex Marine who represent Botnia Targa, XO and Marex. Plus Sunseeker, Princess, Sealine, Fairline, Windy, Hardy and Boston Whaler. Russell Haydn of Salterns says: “This boutique-style boat show has been truly welcomed by the marine industry, main dealers, manufacturers, associated companies, the boating press and visitors alike. MBY editor Hugo Andreae says: “This is a great show, the fact that it’s free to enter for visitors and exhibitors only have to make a small contribution to the promotion fund means that it is a very relaxed atmosphere.